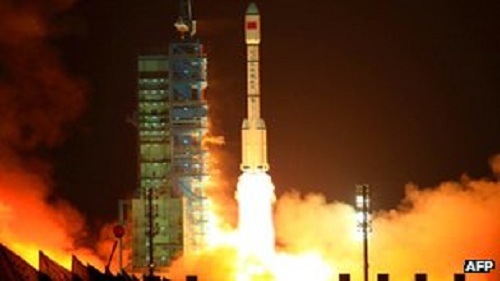 China has announced it will carry out a manned space flight at some point in the middle of June. A rocket carrying the Shenzhou 9 spacecraft has been moved to a launch pad in the north-west of the country. According to state news agency Xinhua, it will carry three astronauts - possibly including a woman - to the Tiangong 1 space station module. This will be China's fourth manned space flight and its first since 2008. It became only the third country to independently send a man into space in 2003. Last year, China completed a complicated space docking manoeuvre when an unmanned craft docked with the Tiangong 1, or "Heavenly Body", by remote control. The astronauts onboard the Shenzhou 9 spacecraft will also dock with the Tiangong 1 - an experimental module currently orbiting Earth - and carry out scientific experiments on board. Xinhua reported that Niu Hongguang, deputy commander-in-chief of China's manned space programme, said the crew "might include female astronauts". The mission is part of China's programme to develop a full orbiting space station. Beijing is planning to complete the 60-tonne manned space station by 2020. China was previously turned away from the International Space Station, a much bigger project run by 16 nations, reportedly after objections from the United States. The Shenzhou-9 manned spacecraft mission successfully completed its first full-system drill on Tuesday afternoon, and everything went well, an unidentified official with the mission said. The drill began at 10:07 a.m. Beijing Time, when the mission entered 4:30 countdown. All systems relevant to the mission, including astronauts, spacecraft, rocket, launch center and the surveillance, control and communication systems, were well-organized and coordinated with each other in good order, according to Xinhua's eyewitness at the Command Hall of the Jiuquan Satellite Launch Center. "The four-and-a-half-hour drill fully tested the conditions of all systems," said the official. "Organization and command are unhindered, technology conditions and equipment are working normally and all the conditions can meet the requirements for the real launch." As the closest event to the real mission, the drill was the first comprehensive maneuver ahead of the launch, with most systems taking part in it. The spacecraft will be launched sometime in mid-June to perform the first manned space docking mission with the orbiting Tiangong-1 space lab module. The official said all systems relevant to the space docking mission have arrived at the launch center, where experts have finished various activities to check the conditions of equipment and maintain the physical conditions of astronauts. A four-hour rehearsal for the country's first manned space-docking mission ended successfully on Tuesday, meaning the launch of Shenzhou IX, scheduled for "sometime around mid-June", can go ahead as planned. The rehearsal, held at the Jiuquan Satellite Launch Center in Northwest China's Gansu province, involved all systems of the mission, such as spacecraft, carrier rocket and launch site. The astronauts selected for the mission also participated in the rehearsal and "worked in harmony", a statement from the space program said. Though their names have yet to be announced, Guangzhou-based Nanfang Daily published pictures on Tuesday showing six astronauts arriving at the Jiuquan Satellite Launch Center, including two female reserve astronauts. Dressed in blue uniforms and black boots, they participated in a flag-raising ceremony and planted trees at their residence inside the launch center on Sunday. Earlier reports said one of the two female reserve astronauts is likely to board the Shenzhou IX spacecraft and become the country's first female astronaut.